'Self-sufficiency in water' is Singapore's new slogan. The government-run Public Utilities Board (pub) has said that from February next year, one per cent of the country's total daily water consumption will be replenished by adding reclaimed wastewater to natural reserves. By 2011, the amount of recycled water will be increased to 2.5 per cent of the total quantity used. The Singapore government's move comes close on the heels of an inconclusive second round of talks with Malaysia on future water prices. 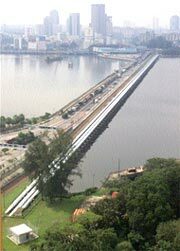 At present, Singapore buys more than half of its water from Malaysia under treaties which start expiring in 2011. In July 2002, the results of a study commissioned by the pub were released. The report recommended a rigorous filtration process called new ater that would allow wastewater from homes and businesses to be rendered potable and mixed into existing supplies. The recycled water, which has a slightly chlorinated taste, will be mixed with Singapore's current supply to replenish treated water with natural minerals and identify chemicals leeched out during the purification process, the board revealed.